Mesfer will miss LSI and Auckland a lot! "The first week I came here I couldn´t speak English. 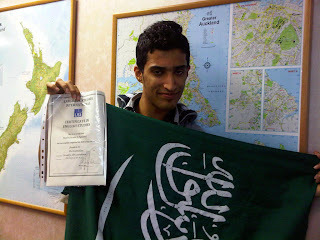 I have studied in Brighton and Saudi Arabia and I have found LSI to be the best school for my English. I can now understand, speak and read English. I have been to other countries and I have found New Zealand to be the best out of all of them. The Coromandel, Rotorua, Bay of Islands are all amazing places to go to. I had never seen rugby before but now I know what it is and how it works. I went to watch the Auckland Blues at Eden Park a couple of times and had a great time. I don´t have any brothers or sisters at home but now I have 2 brothers and 1 sister here in NZ in my homestay family. Sometimes we travelled outside of Auckland and they showed me some beautiful places. I hope to come back to NZ soon to see my family again. Thank you to all my teachers here at LSI, my friends and all of the kiwis, and a big thank you to LSI for everything!"